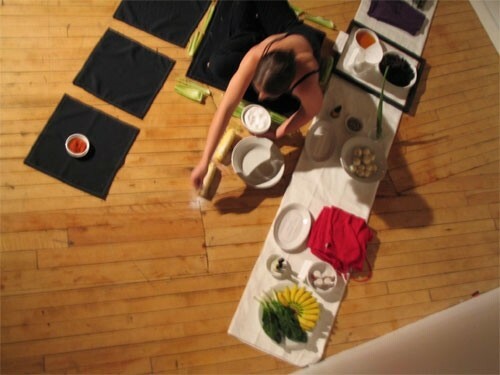 Five 12’ squares of black cloth sit on the floor in front of a long white cloth covered with objects in white bowls and plates. A 24” square of black cloth is in-between the white cloth and the smaller black clothes. One object is placed on each of the small black clothes. The audience is given sheets of paper describing what each alternative’s healing properties are. I intuitively interact with “My Alternatives”, continuing until all 25 alternatives were used.